If you’ve ever waited tables you know that not every shift is created equally. A recent analysis shows just how unequally—and offers tips for taking home more dough. Any restaurant server is all-to-aware of this bitter reality: One night you take home hundreds of dollars in tips and the next, you go home with a few measly singles. Typically, working as a waiter or waitress, you have no idea how long you’ll be working for, how busy your shift will be or whether you’ll get stuck with that wonderful customer who stiffs the bill. So there’s just no such thing as a free lunch for the people serving it. Or is there? Newly released data from CAKE, a restaurant management technology company, shines some light on how you can take home more bacon. 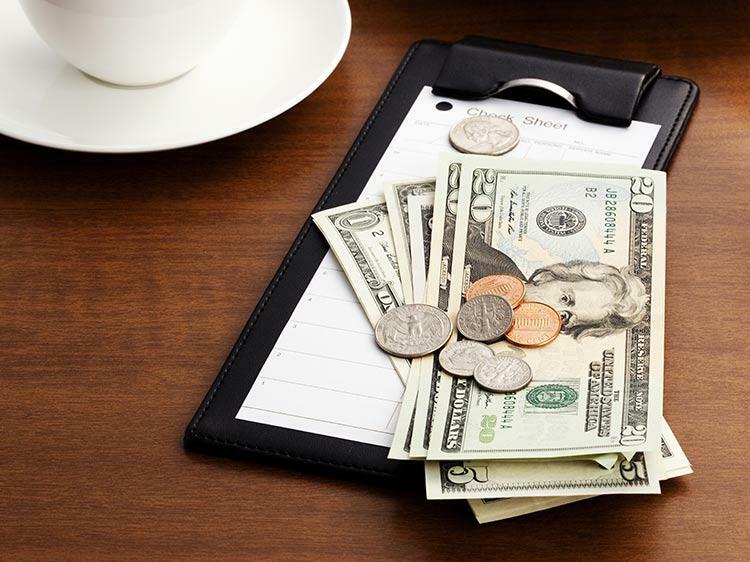 By comparing total revenue to total tips from about 2,000 restaurants nationwide, CAKE found the average percentage gratuity servers make every hour between 10 a.m. and 11 p.m., and the study offers some tips to help you reap more tips. But not so fast. While Sunday morning is the best time for finding generous tippers, every other morning is actually the worst with breakfast times before noon yielding an average 13% to 14% tips. If you prefer to work the dinner shift, late evenings on any day, with the exception of Monday, come in second for highest gratuity earned, with people tipping 18% after 6 p.m. and 19% at 10 p.m. So even though you’re itching to make it to your after-work plans, it pays off when you’re not the first cut. But trade off that Monday shift, as you’ll see only 16% on average. Now, even though customers leave better tips on Sundays, the data found that you’ll actually take more money home on Fridays and Saturdays, as overall revenue is higher on those days. Whether that’s because more people are dining out on those days or they’re just spending more money on their meals, regardless, you’re going to upsell the heck out of tonight’s dessert special. After all, the more money a customer owes, the more money you’ll get out of their gratuity percentage. The time of year also seems to have some affect on how people tip. According to the Eater article, last year, CAKE looked at holiday tipping and found that on holidays like Thanksgiving, Christmas and New Year’s Day, tipping was up 3% compared to regular days throughout the year. Think of it as your holiday bonus. This all sounds great, but what if you can’t get your manager to move you off those unlucky Monday nights, and you never get the coveted weekend slots? The survey didn’t have much to say on that, but fortunately we do: We’ve got thousands of serving jobs on Monster. So you’ve got plenty of options for more profitable shifts. P.F. Chang’s and Chuck E. Cheese both made the most recent edition of the Monster 100—our monthly roundup of companies with the most job listings on Monster. But you’ll also find every type of restaurant, from burger joints like Red Robin and sports bars like Buffalo Wild Wings to steakhouses like LongHorn and high-end restaurant groups like Stephen Starr hiring on Monster. No rush; we’ll give you a minute, so you can look over the full menu of options, and come back to take your order in a bit. Ahem, you are going to tip us right?